Mit dem neuen Semi-Tieflader OSDS-44-03 bietet Nooteboom als einer der führenden Hersteller von Schwertransportfahrzeugen einen Dreiachser speziell für den Transport von großen Radladern oder Dumpern an. Das wichtigste Ziel diesen neuen 3-Achs Semi-Tieflader mit Radmulden ist so viel wie möglich verschiedene Marken und Typen Radlader zu transportieren innerhalb die gesetzliche 40 Tonnen Gesamtgewicht in Deutschland. Das bietet die Transporteur oder Baufirma die meisten Flexibilität und niedrigste Transportkosten. In spite of its low dead weight the Nooteboom semi low-loader with wheel wells is extremely robust and the chassis is torsion-resistant, which means that the lateral stability is excellent when fully loaded. Within the GVW of 40 tonnes the Nooteboom semi low-loader with wheel wells offers a payload capacity of nearly 25 tonnes and up to 35 tonnes with exemption. 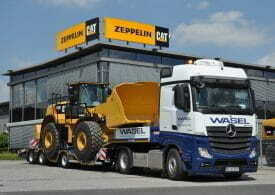 As well as the 40-tonne GVW, the 4-metre transport height is also a very important factor. 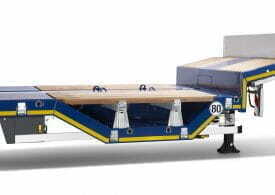 In this semi low-loader the dimensions and positioning are optimised due to the trough in the load floor. 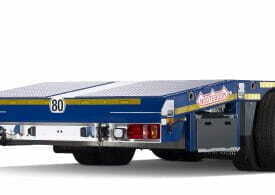 This benefits the transport height as well as the weight distribution. The asymmetrical shape of the wheel wells makes unloading the wheel loaders much easier because it facilitates driving them off the load floor from a standstill. The dimensions and position of the wheel wells has been designed with a wide range of makes and types of wheel loaders in mind. 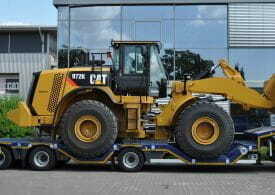 The width of the wheel wells can be extended when carrying very large and heavy construction machinery. For the transport of e.g. tracked vehicles the wheel wells can simply be covered with special, removable panels. This 3-axle semi low-loader is equipped with aluminium ramps or as an option with hydraulic ramps, which are available in many different versions. 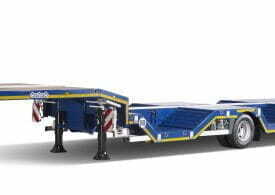 The new OSDS-44-03 semi low-loader is a top-quality product made with first-rate A-brand components only. The conservation of this semi low-loader with wheel wells is extremely durable too and the chassis is treated with a hot metal zinc spray as standard.